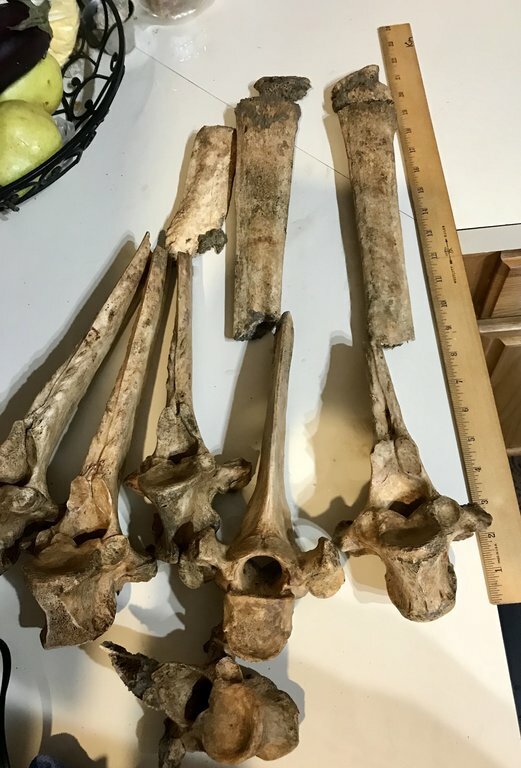 Does anyone have any info for how to determine a species of bison? I have a mandible with teeth and many of the other bones.  I have the full skull too, but no horns. I haven’t prepped the skull yet. That’s going to take me months probably. 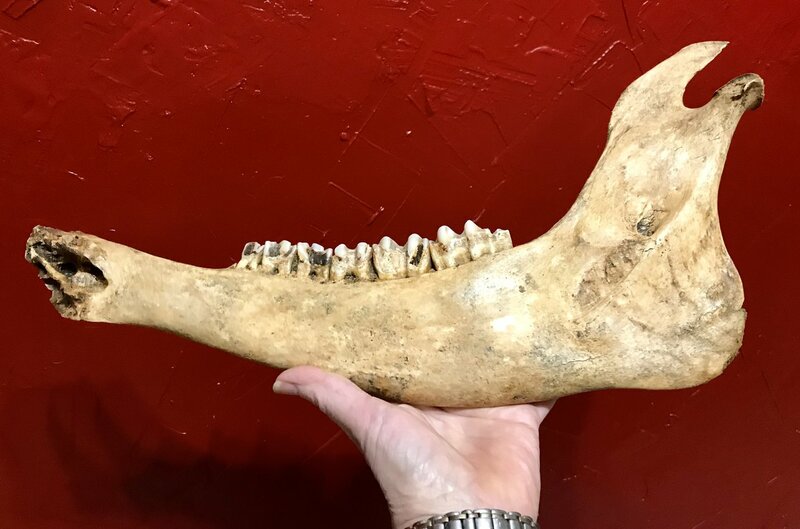 Here is a lower right mandible with a radius. A view of the teeth. 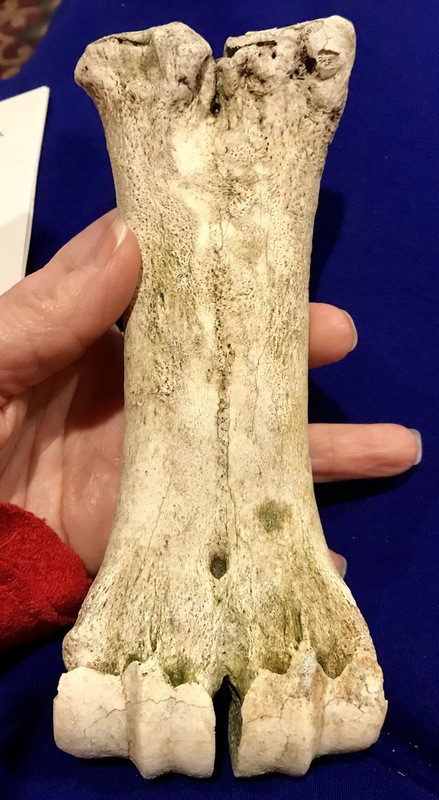 Thoracic vertebrae. The longest is about 22 inches. Some cervical vertebrae and rib fragments and unknown bone fragment. 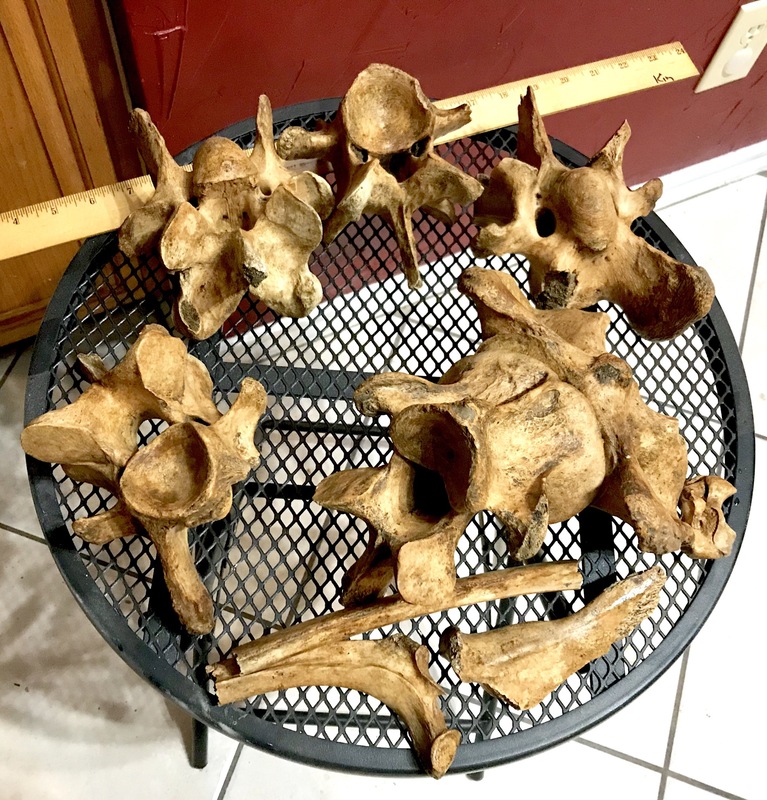 The atlas and axis vertebrae. Very nice collection, Kim! I thought, in North America, it was always Bison bison. in North America, it was always Bison bison. Not always. B. bison is the youngest in the lineage and will most often be found unmineralized or lightly mineralized. Preceded by B. antiquus and B.latifrons in that order as you step back in the record. I’ve found more evidence of the older species with some degree of mineralization, as expected. If horn cores were complete to the tip, they’d be very easily diagnostic. 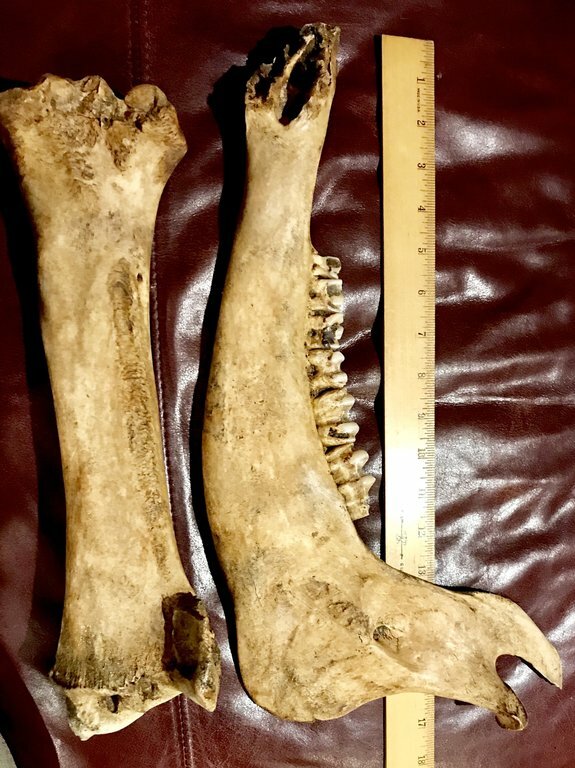 If I were a betting man, on this one I’d throw my money down on B. bison, subfossil, with most confidence if bones are lightweight once cleaned and dried, and similar in density to cow bones. Congratulations! Super find and the fact it was still there months later. I did find a lower mandible if a second bison at the same location a few yards away. About half of it was lightly mineralized. I have the tip of one the left horn core. I suspect a good portion of the right horn is still in the bank, but I don’t know for sure. I saw some material that was very decomposed above and to the right of the skull. It didn’t look like bone. It was more fibrous than bone and of a different consistency. I didn’t know what it was at the time, but 2 days ago it occurred to me it was likely the right horn. I didn’t investigate the area more because all the bones were below it. I just didn’t think of the horn. I assumed it was washed away with the other one. Now I’m not so sure. I found much of it exposed in the creek, which I believe is owned by a church or cemetery. 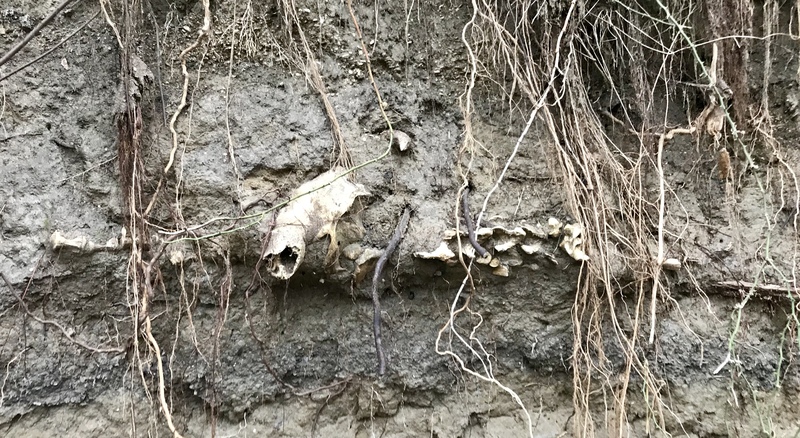 There are bones still in the bank, not exposed. I don’t know if it’s ok to collect them. From what I do know of collecting laws in creeks, if it is exposed and it’s not on state or national park or corp of engineers, no artifacts. . . Then it’s ok to collect. The bones not exposed in the bank don’t really fall under surface finds though. So I don’t know if it’s ok to collect them. Dan, can you help educate me or point me to a source that could educate me? I know things can get sticky. I don’t want to violate any laws. For as ignorant as I am it is possible that I could have violated something without realizing it. Also, do you have a paper or source that would elucidate the differences between the species? Very nice finds, Kim! Hopefully someone can clear up the legal questions for you. 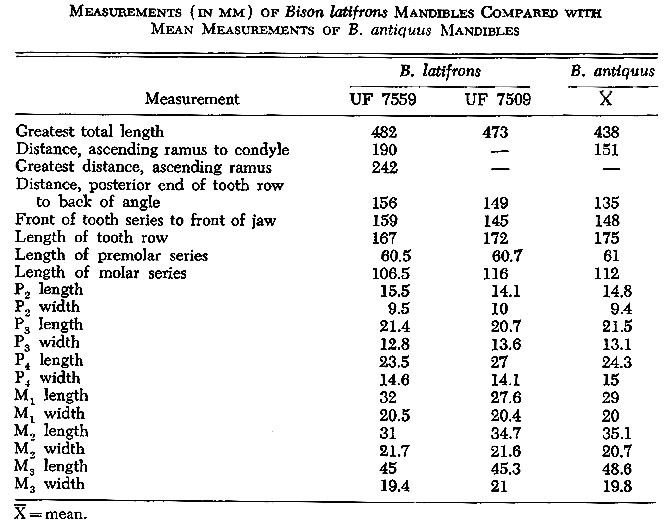 I'm at work and don't have a paper within reach, but if you google images of skulls of B. bison, antiquus and latifrons, you'll see differences in not only the size of the horn cores relative to the skulls, but also the rate of taper and degree of curvature that help differentiate between species. Here’s the best I can do from my phone: a triumvirate of Bison head adornments. 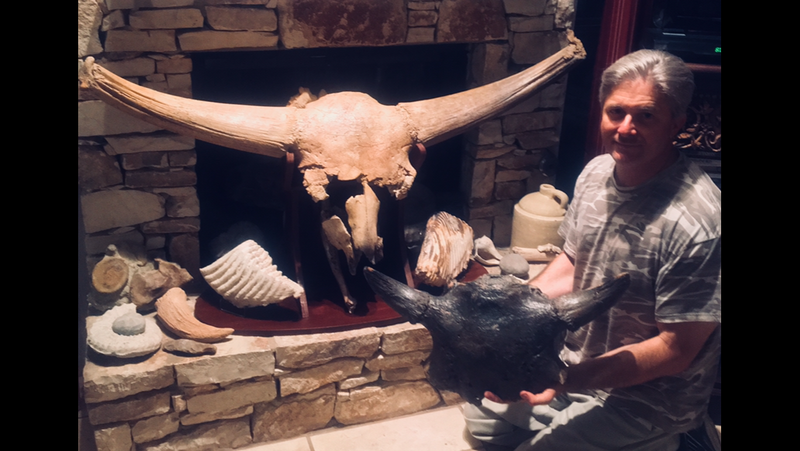 B. bison in hand, B. antiquus horn core lying left of the mammoth tooth on the fireplace hearth pointing roughly toward the camera, overshadowed by a behemoth King Kong daddy of latifrons in the background. Looks like horns got shorter as the species progressed, at least in Texas. I am not finding a good diagram showing where the ramus begins and ends so I can measure the 2nd and 3rd measurements on the first example. Since I don’t have the horns on the skull I am not sure how to distinguish between B. bison and B. antiquus. I do have 6 or more thoracic vertebra with long neural spines or process. 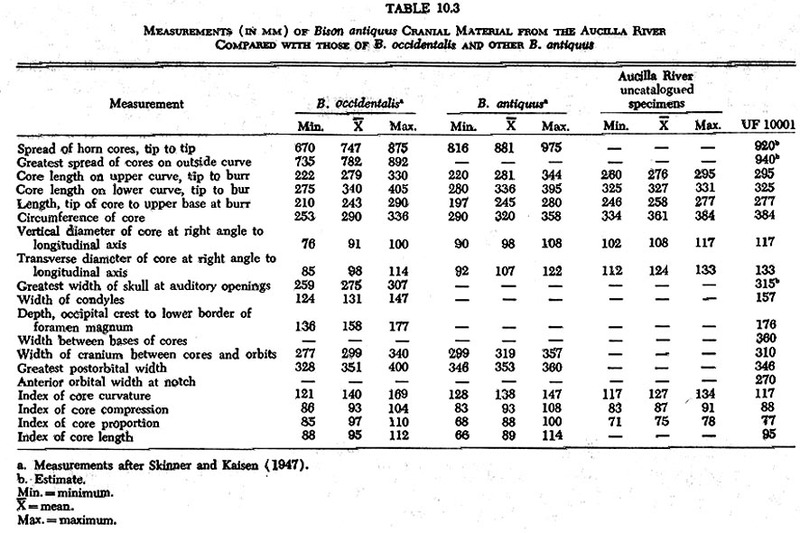 I think the longest is about 23 inches from the anterior side of the vertebra to the dorsal tip of the neural spine. Although, I don’t have them all glued back together. There may be one longer. They were all fractured when found in situ. I don’t know if they have any distinguishing characteristics or not. 23 inches seems fairly long. That’s quite a humpback. 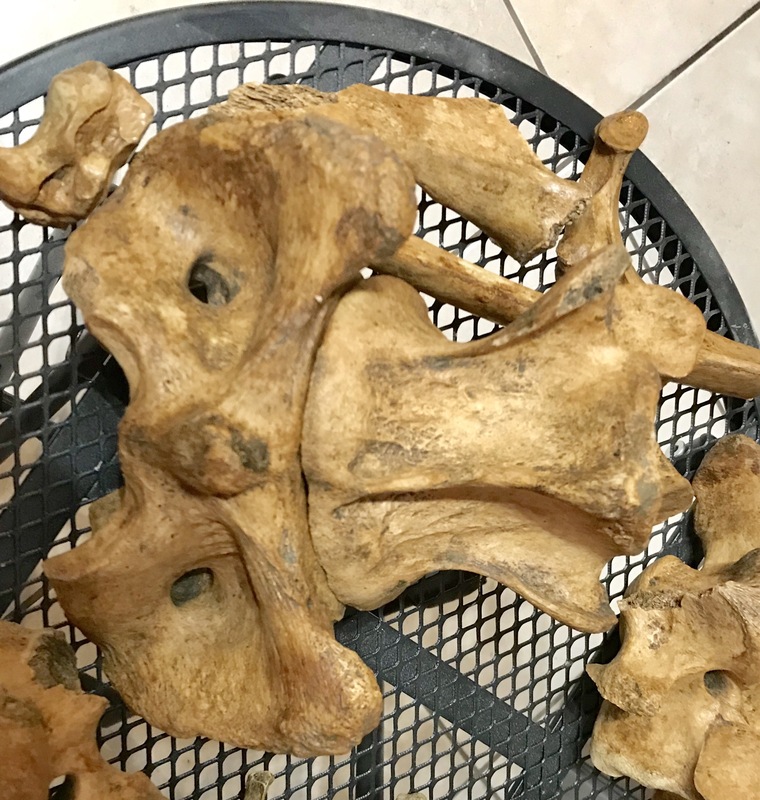 The weird thing is that the thoracic vertebra were to the left of the skull and flipped over on their right side, the opposite direction of most of the the rest of the skeleton, which seemed to be aligned and articulated anatomically correct. The bison appeared to be laying on its side with its spine to the creek.